Crafty Roo Designs: Which way up? These little beauties are so quick and easy to make, but, I can not decided which way they should stand up!!! They are both made using the New Little Lizzie or Lizzie and Friendz. stamp set. Or the New Little Daisy or Daisy and Friendz sets. To make these cards I cut an A4 piece of card in half long ways and folded it at 14.5cm long (trimming off the extra). 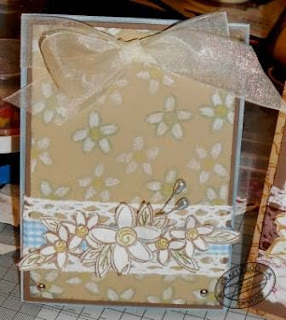 I then stamped the smallest flower around the edge of the card coloured it in and distressed it. Next I cut a piece of card 13.5cm by 9.5cm and tore a smaller piece of handmade paper to mount onto that. Onto the handmade paper I again stamped the smallest flower randomly (using 1st/2nd and 3rd generation images) and distressed all over the paper. This was then mounted onto the piece of card. Around the right hand edge/ bottom (depending which way your card is standing) of the card I wrapped a piece of lace, which had been distressed and over the top of it piece of ribbon. Onto some handmade paper I then stamped 4 of the smallest flower and 2 of the middle sized flower and 4 leaves, to these I added a little bit of colour using pencil crayons. These were then cut out. Once the flowers and leaves were cut out I then arranged them along the lace/ribbon attaching them with glue. 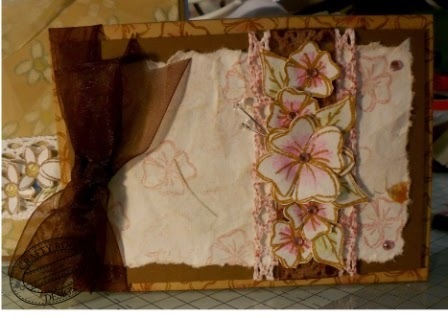 To finish off the card I added a ribbon along the folding edge, a gem in the centre of each flower and in two visible corners. Finally I added 2 hatpins to finish it off. I then distressed around the edge of the card. Next I cut a piece of card 14cm by 10cm and a smaller piece one 13.5cm by 9.5cm of card. Onto the smaller piece of card I stamped the smallest flower randomly (using 1st/2nd generation images) all over the piece of card. Then coloured them in and distressed around the edge. This was then mounted onto the larger piece of card and a sliver brad added to each corner. Around the right hand edge/ bottom (depending which way your card is standing) of the card I wrapped a piece of lace and over the top of it piece of ribbon. Onto some handmade paper I then stamped 4 of the smallest flower and 1 of the middle sized flower and 8 leaves, to these I added a little bit of colour using pencil crayons. These were then cut out. To finish off the card I added a ribbon along the folding edge and 2 hatpins to finish it off behind the flowers.